Youtube instead. What can I say? 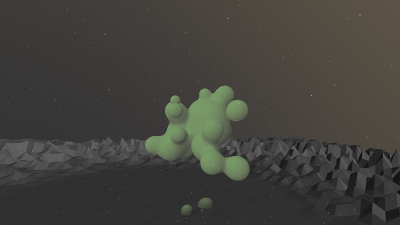 It's a demo with blobs and dust particles, or is it? Simple colorscheme but very nice effects, and I like the music as well! With a little more carefully selected colours, lighting and kerning I believe this could have placed better in the compo. Most scenes have quite a high saturation and opposite colours while they would have worked with a simple, almost unsaturated palette. Music works perfectly with the visuals and I lke the mood. Certainly hope seeing more stuff from you guys. What basscadet said. Lots of potential here, though. The best soundtrack in the democompo, and visuals who fits the flow in the track very vell. Great music, very nice and relaxing tune which fits the demo well. Demo is quite enjoyable too, looking forward to seeing more from you guys! good demo: great effort, beautiful soundtrack. page created in 0.016065 seconds with 15 queries.